A.O. Smith X4 Water Purifier Review: A.O. Smith X4 is a 100% RO water purifier with 2 year warranty on the RO membrane. It incorporates a 5 stage purification system, along with Side Stream RO Membrane Technology. Having reviewed over 50 water purifier models across different brands in India, I’ve got my hands on the A.O. Smith X4 water purifier and here’s my review. Build: A.O. Smith X4 is made with food grade, non-toxic, engineering grade plastics. Such plastic is considered nontoxic and BPA free, this keeps the water bacteria free even when stored for longer duration. The water purifier is flexible to be installed on a table top or wall mounted and it does not eat up the kitchen real estate, thanks to its W314 x D325 x H503 (mm) dimensions that make it look really neat . The body corners are neat, elegant without any sharp corners or gaps between the side panels. The large 9 liter water tank is sufficient to hold enough water required through the day. There isn’t enough gap between the water dispenser and the drip tray to fill a large water bottle, however, you have an option to remove the drip tray while filling large water bottles. Technology: A.O. Smith X4 water purifier is equipped with a basic 5 stages of purification system, wherein the water is passed through the various stages and progressively filtered to get purified water which is stored in the inbuilt storage tank. Stage 4 – RO (Reverse Osmosis) membrane: RO membrane contains semi-p ermeable membrane wherein the water is passed through the semi-permeable membrane to remove TDS (Total Dissolved Solids) and heavy metals like mercury, arsenic, lead, chromium, cadmium etc. It also removes microorganisms like bacteria, virus, protozoa and cysts. Stage 5 – Silver Activated Post Carbon: Water is passed through Silver Activated Post Carbon which acts as polisher and enhances the taste of water. These powerful filters can remove TDS greater than 95% and help in water recovery up to 30% without slowing down the water flow rate at 15 liters per hour. The water purifier is equipped with an inbuilt stabilizer to handle input voltage capacity between 150 to 300 VAC. A simple non-digital dashboard is easy to read with its basic indicators that has a power button, tank full indicator, auto flush indicator, RO change indicator and Silver Carbon indicator that glow when their remaining life 10%, this gives you sufficient time to re-order filters. The auto flush feature is quite useful to clean the RO membrane and improve its life. Design: A.O. Smith X4 Water Purifier is a well designed and simple to use device. The white body color blends well with most of modular kitchen designs and you have an option to choose from 4 front body panel colors. The water dispensing faucet is easy to use when you want to dispense a glass of water, but if you want a large bottle of water, you will have to remove the drip base and lift the water faucet upwards for continuous flow, it’s just that you have to get used to the design and its not really a rock lifting task. Service & Price: A.O Smith is headquartered in Bengaluru, Karnataka and has regional presence in Mumbai and Delhi. A.O. Smith water purifiers are sold and serviced in major cities of India and the company plans to expand its presence to other cities very soon. The pre-filters and sediment pre-carbon filters have an average lifespan of 2500 liters and the expensive RO membrane can purify between 6000 to 12000 liters of water depending on the input quality. You also have an option to sign up for an annual maintenance contract that shields your investment. A.O. 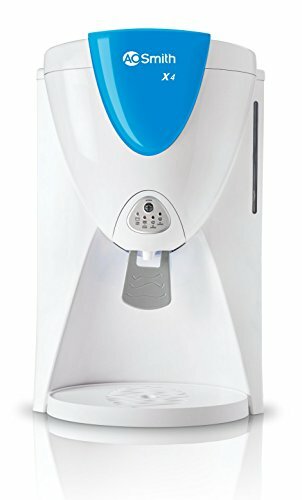 Smith X4 water purifier is retailing at ₹ 16,750.00 and is available online at Amazon.in from ₹ 14,790.00, customers are eligible for the same 2 year warranty and free installation when purchased online at Amazon.in. Conclusion: A.O. Smith X4 water purifier is best suited for corporation or municipal water, it does its job with simple design and strong 5 stage water purification technology. The device lacks UV purification and post-carbon filtration to handle any source of water, at the price point of ₹ 16,000.00, you have plenty of choice to pick from, I would personally reccomend the all-round Pureit Ultima RO+UV.